Remodeling your kitchen? We know how overwhelming it can be from making design decisions, completing installations and making sure everything stays within budget. One of the biggest decisions you’ll make is not the countertops or backsplash, but your kitchen cabinets. Determining what cabinets to install can be an intimidating decision from price to style. If you opt to go for new cabinets instead of refacing your existing cabinets, we recommend custom cabinets. While kitchen cabinets are a steep expense, going custom will ensure that you’re getting the most out of your kitchen remodel. Here are some benefits of custom kitchen cabinets. Unlike stock cabinets, custom built cabinets are designed to fit perfectly into your kitchen no matter the size or shape of the room. 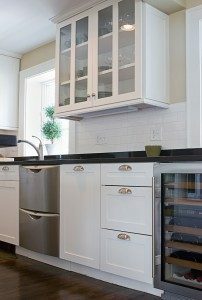 Stock cabinets don’t provide you with a lot of wiggle room when it comes to the layout and design of your kitchen cabinetry because they don’t cater to your specific kitchen dimensions. Custom cabinets are designed to maximize the space that you have without sacrificing design. With custom cabinets you can design a kitchen layout that fits your cooking style. You can go to the drawing board and create a kitchen that is functional and efficient without having to compromise any unhelpful or awkward placement you may get from stock cabinets. Stock cabinets are more limited in design than custom cabinets. Don’t settle for the only product that’s available or the only finish that has all of the cabinet sizes you’re looking for. The last thing you want to do when you’re designing your kitchen is settle. Remember this is a big investment, don’t throw it away on something you’re not 100 percent in love with. Custom cabinets are extremely durable. Because they’re individually handcrafted to fit your needs, they’re also made with care as opposed to mass produced stock cabinets. Interested in custom cabinets? Give us a call at Nu-Face Home Improvement. We can not only revive your old cabinets, but we can also provide completely new cabinet installations as well. For any questions or more information about our refacing process call us today or click here for a free quote.